Yes, and it's one of the best! However, ECP offers much more. It can provide you and your Toyota with coverage such as the Oil and Filter / Inspection Program*, towing, emergency road service, rental assistance, trip interruption assistance, tire road hazard protection and travel planning assistance. It can take over with mechanical protection when your Toyota factory warranty ends providing coverage for up to seven years or 200,000 kilometres. Extra Care Protection enhances the resale value of your Toyota. Simply complete, sign and return the transfer form to ECP. There is no extra charge for the transfer!! 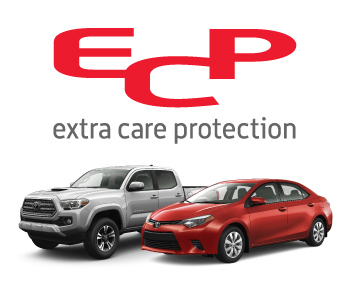 ECP gives you better value - even when you sell your Toyota. Virtually every component is covered. See coverage section for details. Oil and Filter / Inspection Program* *Plan must be purchased within 31 days of vehicle registration date. Please see Dealer for specific program details. Vehicle Rental Assistance ECP helps get you home even if your vehicle has to stay in the shop overnight due to the failure of a covered component. Trip Interruption When you are over 300 km from home, if a covered component fails call the toll-free number. ECP assists with up to $100 a day for 3 days for a maximum of $300 per occurrence. Accident Towing To your preferred Toyota Dealership within 50 kms or to the nearest Toyota Dealership within 300 kms. A second tow will be provided, if necessary, from an accident-reporting centre. We have you covered. With 17 major mechanical component groups for a comprehensive coverage. Engine Engine block and all internally lubricated mechanical components, cylinder heads, timing chain tensioner, valve covers, oil pan, engine mounts, intake and exhaust manifolds, turbo/supercharger assembly, crankshaft pulley, harmonic balancer, flywheel, flex plate, starter ring gear, oil pump, air cleaner assembly (except air filter), engine oil filter bracket/union, balance shaft, balancer housing. Manual Transmission / Transaxle Case and all internally lubricated mechanical components, extension housing, mounts, clutch master cylinder, clutch release cylinder. Automatic Transmission / Transaxle Case and all internally lubricated mechanical components, extension housing, oil pan, torque converter, mounts, shift solenoids, oil cooler and lines, oil pump, shift control computer. Front / Rear Wheel Drive Differentials and all internally lubricated mechanical components, CV-joints, U-joints, bearings, bushings, propeller shafts, axle shafts, yokes, couplings. Four Wheel Drive (4WD) Transfer case and all internally lubricated mechanical components, front/center/rear differential assemblies and all internally lubricated mechanical components, front hub and spindle assembly (including locking device). Cooling System Water pump and pulley, coolant reserve tank, thermal fan switch, coolant solenoid valve, fluid coupling, cooling fan assembly, engine oil cooler and lines, radiator. Fuel System Fuel tank, fuel pump, throttle body, injectors, fuel level sending unit (in tank), fuel lines, valves, fuel regulators. Front / Rear Suspension Suspension arms, stabilizer bars and links, rear carriers, ball joints, bushings, struts, shocks, wheel bearings. Steering Steering gear housing and all internally lubricated mechanical components, control valves, steering column, steering column shafts and couplings, steering knuckles, power steering pump and pulley, pressure hoses, rack ends, bearings, cooling lines, power steering fluid reservoir tank. Air Conditioning & Heating (Original equipment or Manufacturer's Approved Kits only). Compressor and pulley, condensers, evaporators, expansion valve, control units, magnetic clutch, receiver/dryer, amplifier, servo motor, cooling fan motor, pressure switch, blower motors, heater core. Brake System Master cylinder, master cylinder reservoir, brake booster, calipers, parking brake lever and linkage, proportioning valve, backing plates, wheel cylinders, brake lines and fittings, ABS actuators. Electrical System Alternator and pulley, starter assembly, power window motors and regulators, exterior mirror motors, electric door lock actuators, power seat motors and gears, sunroof motor, wiper motors, power antenna, distributor (except cap, rotor and wires), direct ignition coils (distributor-less system), electronic ignition igniters, cruise control actuator, transmission shift solenoid, wiring harness, washer pumps, headlight washer pump, horns, power point sockets, all manually and mechanically operated factory installed switches. High Tech Factory Installed All sensors, all computers (including but not limited to: cooling system, keyless entry, theft deterrent, sunroof, air conditioning, transmission shift, steering control, ABS/VSC, shift lock), air flow meter, idle air control valve, EGR valve, vacuum switching valve, body and door control modules, electronic heater/ A/C control, wiper control module. Body Interior Manual/Automatic shift lever and shift lever subassembly, manual window regulators, parking brake handle, inside door handles, manual window regulator handles, glove box lock mechanism, child safety door lock mechanism. Body Hardware Door hinges (front, rear, hatch), outside door handles (front, rear, hatch), hood and hatch supports, fuel door release cable, hood release cable, trunk release cable. Seals & Gasket / Fluids & Filters All seals and gaskets used to contain fluids/lubricants within covered components. Every ECP repair includes the replacement of coolant, refrigerant, transmission fluid and filter, engine oil and filter, hydraulic fluids and lubricants when required as a result of the failure of a covered component. Hybrid Components (For Hybrid vehicles only) Hybrid battery, battery control module, hybrid control module, inverter with converter. Owner Maintenance Items Toyota Extra Care Protection plans for new Toyota's do not cover maintenance items such as but not limited to: bulbs, trim, mouldings, glass, lenses, paint, exhaust system, brake pads, linings, upholstery, etc. These items are considered to be ongoing maintenance items and are the responsibility of the vehicle owner. Further details on owner's responsibilities are found in the Toyota owner's manual supplement. This page is intended to provide an outline of Toyota Extra Care Protection plans. For more information, contact us here. Coverage is based on information available at time of publishing and is subject to change without notice. * Whichever comes first + Plans must be purchased within 31 days of vehicle registration. Ask your Dealer for details regarding a plan that best suits your driving needs. Terms available for New Vehicle Program. Eligible vehicles must be within 36 mths/60,000 km of the original vehicle registration date. There are only a very few components we don’t cover!. Parts not covered are all glass (including mirrors, heated windshields and rear windows with defroster), fog lamps, lenses, sealed beams, lamps, light bulbs, tires (36/50 only), wheels or wheel studs, trim, seat frames, convertible top, mouldings, weather-strips, bright metal, sheet metal, body parts (including frame), bumpers, upholstery, carpet, paint, brake rotors and drums, brake linings and pads, batteries and cables, distributor cap and rotor, carburetor, manual clutch disc lining, pressure plate and bushings, throw-out bearings, catalytic converter (which may be covered by Emission Control Systems Warranties) and exhaust system, and non-manufacturer installed accessories. In addition, maintenance services and parts; including all lubricants and filters, belts and hoses, wheel balancing or alignment, any adjustments for air and water leaks, wind noise, squeaks and rattles as well as alignment of bumpers, sheet metal, body parts and glass are not covered. This page is intended to provide an outline of Toyota Extra Care Protection plans. For detailed information, see your Toyota Dealer. Coverage is based on information available at time of publishing and is subject to change without notice. Vehicle Rental Assistance ECP helps get you home even if your vehicle has to stay in the shop overnight due to the failure of a covered component. The ECP Comprehensive Coverage gives you all the benefits of the Powertrain Coverage Plan plus the Major Component Coverage Plan. We have you covered with 15 mechanical component groups. The Comprehensive Coverage Plan is available for vehicles up to seven model years old. Engine Engine block and all internally lubricated mechanical components, cylinder heads, timing chain tensioner, valve covers, oil pan, engine mounts, intake and exhaust manifolds, turbo/supercharger assembly, crankshaft pulley, harmonic balancer, flywheel, flex plate, starter ring gear, oil pump, air cleaner assembly (except air filter), engine oil filter bracket/union, balance shaft, balancer housing. Manual Transmission / Transaxle Case and all internally lubricated mechanical components, extension housing, mounts, clutch master cylinder, clutch release cylinder. Automatic Transmission / Transaxle Case and all internally lubricated mechanical components, extension housing, oil pan, torque converter, mounts, shift solenoids, oil cooler and lines, oil pump, shift control computer. Front / Rear Wheel Drive Differentials and all internally lubricated mechanical components, CV-joints, U-joints, bearings, bushings, propeller shafts, axle shafts, yokes, couplings. Four Wheel Drive (4WD) Transfer case and all internally lubricated mechanical components, front/center/rear differential assemblies and all internally lubricated mechanical components, front hub and spindle assembly (including locking device). Cooling System Water pump and pulley, radiator, cooling fan assembly, thermal fan switch. Fuel System Fuel tank, engine control computer, fuel pump, fuel lines. Front Suspension Suspension arms, links and stabilizer bars, struts, bushings, wheel bearings, shocks. Rear Suspension Suspension arms, wheel bearings. Steering Steering gear housing and all internally lubricated mechanical components, control valves, steering column, steering column shafts and couplings, power steering pump and pulley, pressure hoses, steering control computer, steering knuckles. Air Conditioning & Heating (Original equipment or Manufacturer's Approved Kits only). Compressor and pulley, condensers, evaporators, expansion valve, control units, magnetic clutch, receiver/dryer, amplifier, servo motor, cooling fan motor, pressure switch, blower motors, heater core. Brake System Master cylinder, brake booster, calipers, wheel cylinders, ABS computer and actuators, master cylinder reservoir, proportioning valve. Electrical System Alternator and pulley, starter assembly, electronic ignition igniter, windshield wiper motor and washer pumps, power window motors and regulators, blower motors, power seat motors and gears, sunroof motor and computer, cruise control actuator and computer, power antenna, wiring harness. High Tech Factory Installed All sensors, all computers (including but not limited to: cooling system, keyless entry, theft deterrent, sunroof, air conditioning, transmission shift, steering control, ABS/VSC, shift lock). Seals & Gasket / Fluids & Filters All seals and gaskets used to contain fluids/lubricants within covered components. Every ECP repair includes the replacement of coolant, refrigerant, transmission fluid and filter, engine oil and filter, hydraulic fluids and lubricants when required as a result of the failure of a covered component. Extra Benefits All three ECP plans keep you covered with these extra feature benefits: Towing, Emergency Road Services, Vehicle Rental Assistance, Trip Interruption Assistance and Travel Planning Assistance Owner Maintenance Items Toyota Extra Care Protection plans for new vehicles do not cover maintenance items such as but not limited to: bulbs, trim, mouldings, glass, lenses, paint, exhaust system, brake pads, linings, upholstery, etc. These items are considered to be ongoing maintenance items and are the responsibility of the vehicle owner. Further details on owner's responsibilities are found in the Toyota owner's manual supplement. This page is intended to provide an outline of Toyota Extra Care Protection plans. For detailed information, see your Toyota Dealer. Coverage is based on information available at time of publishing and is subject to change without notice. * Whichever comes first Ask your Dealer for details regarding a plan that best suits your driving needs. USED PROGRAM - TOYOTA Plan must be purchased at the point of vehicle sale. "A" + "B" = "C"
The Major Component Coverage Plan is the affordable plan for those vehicles which may still have a remaining manufacturer's Powertrain warranty. This plan covers conditioning and selected electrical components. The Major Component Coverage Plan is available for vehicles up to seven model years old. The Major Component Coverage Plan is the affordable plan for those vehicles which may still have a remaining manufacturer's Powertrain warranty. We have you covered. With 11 mechanical component groups. This plan covers a substantial number of major components including air conditioning and selected electrical components. The Major Component Coverage Plan is available for vehicles up to seven model years old. Cooling System Water pump and pulley, radiator, cooling fan assembly, thermal fan switch. Fuel System Fuel tank, engine control computer, fuel pump, fuel lines. Front Suspension Suspension arms, links and stabilizer bars, struts, bushings, wheel bearings, shocks. Rear Suspension Suspension arms, wheel bearings. Steering Steering gear housing and all internal lubricated mechanical components, control valves, steering column, steering column shafts and couplings, power steering pump and pulley, pressure hoses, steering control computer, steering knuckles. Air Conditioning (Original equipment or Manufacturer's Approved Kits only). Condensers, evaporators, compressor and pulley, magnetic clutch, control units, expansion valve, receiver/dryer. Brake System Master cylinder, brake booster, calipers, wheel cylinders, ABS computer and actuators, master cylinder reservoir, proportioning valve. Electrical System Alternator and pulley, starter assembly, electronic ignition igniter, wiper motor and washer pumps, power window motors and regulators, blower motors, power seat motors and gears, sunroof motor and computer, cruise control actuator and computer, power antenna, wiring harness. Electrical Switches Courtesy light, neutral safety, handbrake, reverse light, hood/trunk/glove box light, clutch safety, brake light, tailgate, driving pattern select High Tech Factory Installed All sensors, all computers (including but not limited to: cooling system, keyless entry, theft deterrent, sunroof, air conditioning, transmission shift, steering control, ABS/VSC, shift lock). Seals/Gaskets/Fluids and Lubricants All seals and gaskets used to contain fluids/lubricants within covered components. Every ECP repair includes the replacement of coolant, refrigerant, transmission fluid and filter, engine oil and filter, hydraulic fluids and lubricants when required as a result of the failure of a covered component. Engine Exhaust manifold. Extra Benefits All three ECP plans keep you covered with these extra feature benefits: Towing, Emergency Road Services, Vehicle Rental Assistance, Trip Interruption Assistance and Travel Planning Assistance Owner Maintenance Items Toyota Extra Care Protection plans for new vehicles do not cover maintenance items such as but not limited to: bulbs, trim, mouldings, glass, lenses, paint, exhaust system, brake pads, linings, upholstery, etc. These items are considered to be ongoing maintenance items and are the responsibility of the vehicle owner. Further details on owner's responsibilities are found in the Toyota owner's manual supplement. This page is intended to provide an outline of Toyota Extra Care Protection plans. For detailed information, see your Toyota Dealer. Coverage is based on information available at time of publishing and is subject to change without notice.